Michael Price is an Emmy Award winning writer and producer. Michael is best known for his work on The Simpsons where he joined the team in 2002 and is also a co-executive producer. Curious who Michael’s favorite Simpsons character to write for is? Understanding what it’s like to write and produce an animated series was a great learning experience for us. 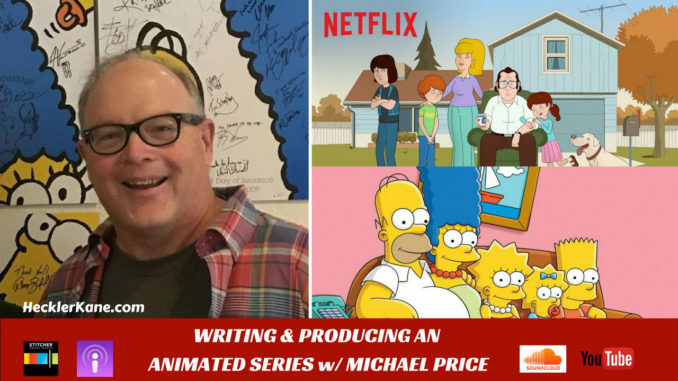 We discuss how Michael landed his sweet gig at the Simpsons, growing up in New Jersey and his favorite childhood cartoons. Following up on his success with The Simpsons, Michael was tapped for the wildly popular Lego Star Wars animated TV Series. Installments include The Yoda Chronicles, The Empire Strikes Out and Droid Tales. Striking a chord with fans young and old, Michael has proven he has is one of the great comedic writers of our time. Michael partnered with comedic mainstay Bill Burr for his latest project F is For Family. Together they created the animated series, available now on Netflix. Finding a home on Netflix makes sense with its built in audience of Bill Burr fans from his exclusive stand-up specials. Watching F is for Family is a reminder of a simpler yet more complicated time. The show takes place in 1973 and is beaming with its roots in classic comedy. F is For Family also stars Justin Long as the 14 year old stoner misguided son. Laura Dern stars as the lovely house wife who’s appearance of happiness to the world is merely a cover-up for her unfulfilled dreams. Look out for Season 2 of F is Family coming to Netflix soon! Okay that was just awesome.